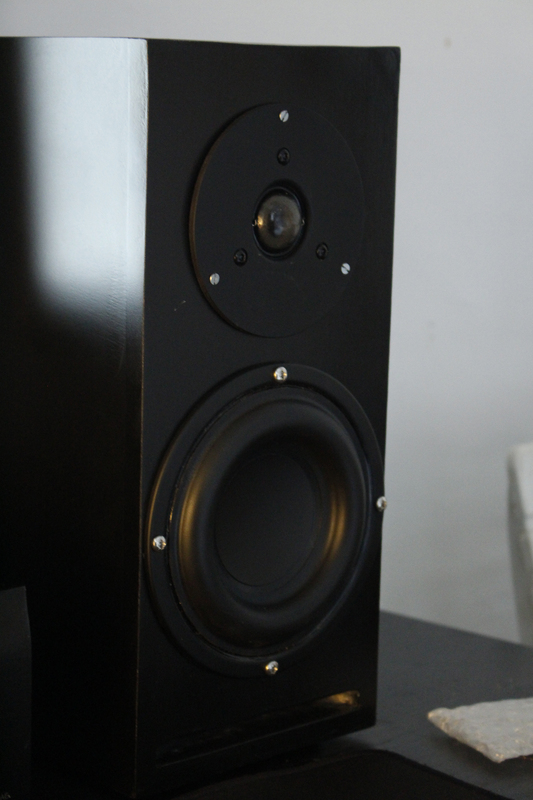 A set of bookshelf speakers for my desk. 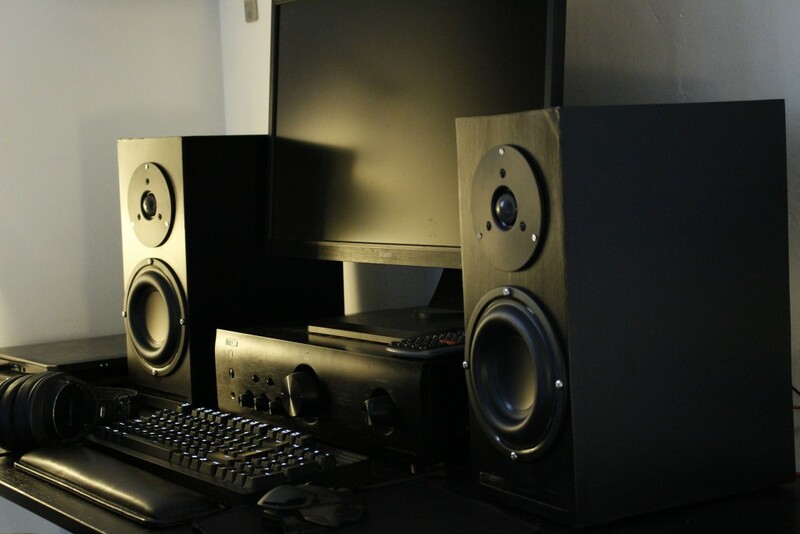 The design goals for this project were to design and build a set of speakers; that were both small enough to fit on the desk, and with a deep enough bass response as to not require a separate sub under the desk. To keep costs down I decided on a 2-Way speaker. 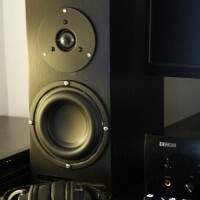 For the drivers I’ve use the Tang Band W5-1138SMF subwoofer, as the woofer. 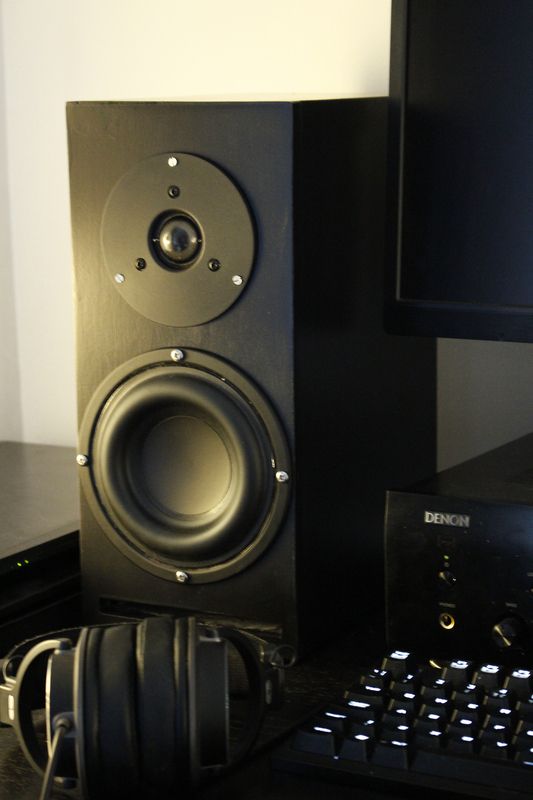 Choosing a subwoofer over a conventional woofer meant I could get more bass extension from the 7 litre enclosure. 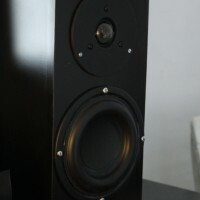 And the Dayton Audio DC28F-8 is the tweeter, being budget friendly with a good reputation for performance per dollar and going low enough to meet the W5-1138SMF. The enclosure is a front slot ported (because of the proximity of walls), bass reflex enclosure. The port is very long, running to the back of the enclosure, up the back and a bit forward again. This helps to give it a very low tuning of about 35 Hz; important for the bass extension. The bottom, back and top are foam lined to damp the enclosure, with the crossover glued to the side. 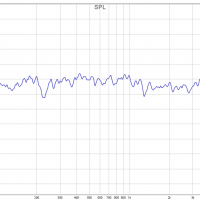 The W5-1138SMF has a significant, but smooth, hump between 1000 and 2000 Hz. So I had to start the roll off relatively early (compared to where they actually cross). I achieved this with a 2nd Order low pass filter using a 0.8 mH inductor and a 50 μF capacitor. The tweeter is hooked up to a 3rd order high pass filter consisting of a 8.3 μF (3.3 + 1 + 4) cap, 0.6 mH inductor, and 24.8 μF (6.8 + 10 + 8) cap. With an L-Pad made of 5.5 Ohm (5 + 0.5) (series), and 3.7 Ohm (parallel) resistors. In the end, I think they sound great! They definitely meet the design criteria and have a solid frequency response down to 35 Hz, truly mini-sub performance without needing a separate sub. 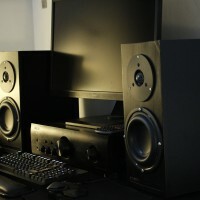 A guy who likes audio stuff from the UK. This is in fact my first build. Please add how to wire the crossover! !